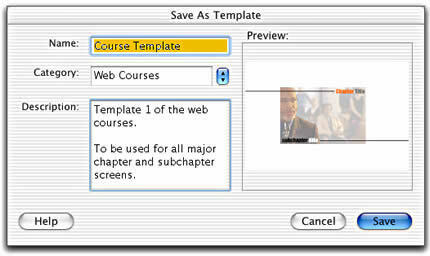 Creating templates is as simple as saving a file in Flash MX. After we cover saving a file as a template, we'll go into some common design techniques for organizing and setting up your templates. 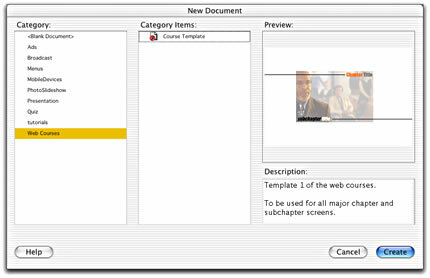 Create a new document in Flash MX with any graphics or objects you want to be included in your template. Go up to File>Save As.. In the Name field type in a name for your template. I named this template "Course Template." In the Category field type in a new category or select an existing category from the drop down menu. Since this is a custom template for a new category, I'll create a new category by typing in the name: Web Courses. In the Description field type in a brief description of your template. That's all there is to it. You have now saved a document as a template. Select the Category that contains your desired template. In this example, I created a new category called "Web Courses" which is the category I will select. In the Category Items list, select the template you wish to use. In this example there is only one template called "Course Template." Click the template name once to preview the first frame of the file as well as to read the description in the Preview list. Typically, I will first create my Flash document using Layer Folders, Guide Layers, and Background Elements and then save the document as a Template.